The Cycling for Libraries tour was an experiment on what comes up in the minds of library professionals when they go out and ride bicycles for nine days together. Answer: far-reaching discussions about the future of libraries in the changing world, and a great team spirit as the group worked it's way 700 km from Copenhagen to Berlin. In the beginning we got to know each other and figured out by trial and error how to travel in a group. We saw beautiful Danish seaside landscapes, enjoyed meals prepared for us by our cook, were warmly welcomed in a local libraries, spent much more time on the road that the organizers had expected, got tired fixing punctured tyres in the rain, felt the bliss of a hot shower and slept side by side on the floor in a school. After a couple of days the weather became more sunny, daily distances a bit shorter, bicycles were in better shape and also other topics than cycling and survival started to pop up in the discussions. As we didn't have books, documents or Internet in front of us, it was easier to think of broader topics than details. We talked about our projects, library politics, online presense and social changes — and of course about cycling, traveling and other hobbies. The organizers had prepared for each day a theme, which was announced in the morning briefing. That guided the discussions a little bit, but ultimately it was up to each participant if they wanted to follow the theme, pick some other topic or simply listen to the nature and enjoy cycling. In the evening we were usually too tired and at the same time excited about what had happened during the day, that it was not easy to focus on any common theme other than food, beer and sleep. A topic I found particularly interesting was the role of libraries as participants in social and environmental issues. One idea which came up was to create a global warming information finding aid: a shelf containing books, dvds and other resources on the topic, including hints what people can do themselves in everyday life. Libraries taking part in the campaign would place the shelf in a prominent place where visitors would easily see it. Different viewpoints should be offered to maintain the reputation of libraries as an impartial and trusted source of information. Just as media can influence the thoughts and focus of its audience by choosing the topics to write about, libraries have more subtle but similar power through choosing which books and other resources are most visibly presented - including recommendations given by librarians online. Whether or not and how that power should be used is naturally not a trivial question. In any case, libraries can provide resources which give both a broader view and go deeper than a single TV show or newspaper article ever will. One goal of the trip was to get library folks outdoors and challenge them. 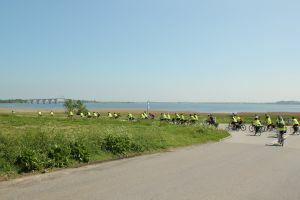 Several participants were first time taking part on a longer cycling tour. Accommodation was modest so people were together also in the evenings instead of locking themselves in hotel rooms. Day by day the team spirit grew, people helped each other and made sure nobody got lost or left behind. Everybody made it until the end, and many wrote afterwards that in their minds they were still cycling several days after the trip. The Kirjastokaista team with their video cameras were with us during the whole tour. Almost everything was therefore freshly documented in detail and a short video of each day's events was posted online every evening. In that way the tour itself was an example of rapid information sharing using modern channels. A half an hour documentary is planned to come out later in the autumn. I'm looking forward to watching it. Today starts an interesting event called Cycling for Libraries. About 80 library professionals and other people, whose work is somehow connected to libraries, will be spending nine days cycling from Copenhagen to Berlin. The goal is to combine work, fun and healthy exercise outdoors in a new and exiting way. The welcome party was yesterday evening at the Copenhagen main library, featuring a pedal powered ice cream and coffee bar. Cycling for Libraries is a moving conference, where the main focus will be on the informal discussions between talks and other organized sessions. Hey, those are often the most interesting bits in conferences anyway. There will be some seminars, workshops and visits at local libraries on the way, but most of the time the participants will create the event themselves. I'm curious to see how much of the discussions will be focused on library topics, how much on cycling and how much on everything else. The organizers don't have a clue either, they're also doing this the first time. For me it'll be the second time to participate in a organized cycling tour. Cycling for Libraries will not be as ecological and down to earth as the Ecotopia Biketour I joined in 2006, but still relatively low on luxury for a professional event. Accommodation will be at campsites, hostels and schools. I like that — sharing the space in a dormitory room or in a tent is a good way to get to know each other. It's also a great opportunity to get out from my home office. It's too easy to get stuck to routines there, and have too little communication with the outside world. I came to Copenhagen a few days in advance and have really enjoyed my time here. Almost everybody is moving around by bicycle and that gives a special spirit to the whole city. Already on the first day, crossing a canal on a big bridge together with dozens of other cyclists and only a few motorists, I had a great feeling of being part of the community.